Edward VII Sterling Silver Dish, London, 1904-05, William Comyns, maker, floriform, with embossed cherubs to the center framed by foliate scrolls, lg. 12 1/8, approx. 10 troy oz. 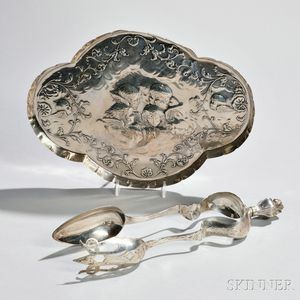 ; together with a pair of Dutch .934 silver tongs, 1876, maker's mark "HT," lg. 12 1/4 in.